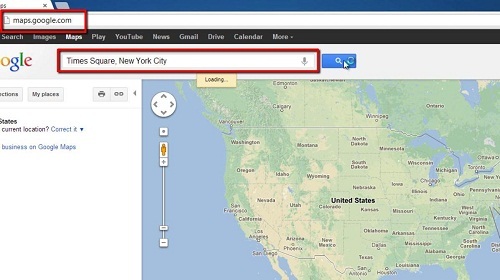 In this tutorial you will learn how to use google map street view. Visit “www.maps.google.com” and in the search box at the top type the place that you want to see in street view mode. 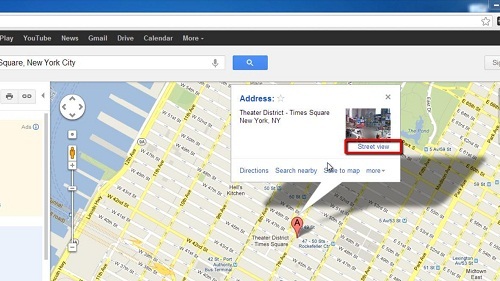 In this example we are going to see Times Square so enter “Times Square, New York City” in the search box. In the frame on the right a map will load with a marker indicating Times Square. A small frame will have appeared pointing to the “A” marker on the map. Within this frame there is a button called “Street view”, click this. You will now be taken to street view mode and you can click and drag in this window to adjust your view of the area. Click on different parts of the screen to navigate your way around the area. Let’s have a look at another way to access street view. Click the minus arrow on the left side of the street view frame to bring up the overhead map view. Now above the zoom scrollbar on the left you will see a small orange man, click and drag him over the map on the right. Simply drop him onto any street that has been highlighted in blue – these are the ones that have street view available. 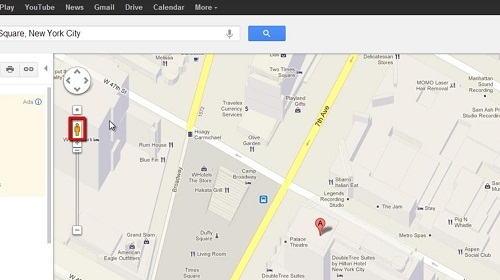 You will now have a street view of wherever you have dropped him and that is how to use google map street view.